Let’s start with the top: the cast trigger of Mister Biggles, which lets you gain life and draw cards. Cast triggers are a way to (usually) make sure you get off what it is you’re attempting to try and do, even if it gets answered immediately, and a mini-Sphinx’s Revelation is quite good! It’s inefficient at times (it’s unlikely that you would pay 4GU to draw 2 cards and gain 2 life), but it does give a bit of extra pop to the main attraction. And the main attraction is an adorable Jellyfish Hydra Beast with a lot of teeth. That 4GU “draw 2, gain 2” looks a lot better when it’s attached to a 4/4 with flying and trample. 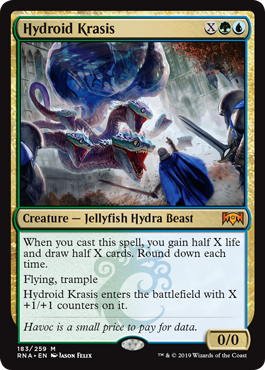 Those two keywords together make it even harder than normal to answer adequately, and there might be some decks that flat-out die to a sufficiently-large Hydroid Krasis. Refilling your hand makes it a good finisher for control decks, and even more midrange-type decks like having an inevitable answer like Mister Biggles for closing out games. Have you ever played with Sphinx’s Revelation from Return to Ravnica? It’s much more powerful than it looks, and can make games outright unwinnable for some opponents. Have you ever played with Hydradoodle from Unstable? It’s also much more powerful than it looks, and not just because it comes in the same watermark as Druid of the Sacred Beaker, one of the most powerful silver-bordered mana ramp cards. It stands to reason that putting those two effects together would make for a desirable card. There may not be anything like Primeval Titan in Standard, but we have the next best thing: a multicolored environment where you can “splash” this guy into a surprising range of decks. Every deck likes to draw cards, and every deck could use an oddly friendly-looking snake monster.